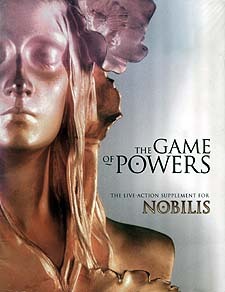 The Game of Powers expands the worlds and rules of Nobilis, moving play away from the tabletop and into live action. * Guidelines and advice on how to design, prepare, run and play in live-action adventures in the universes of Nobilis. Clearly structured and easy to grasp, The Game of Powers is a painless crash-course in everything a player needs to create Nobilis adventures more dramatic than they dreamed possible. * Dynamic Nobilis, a fast-moving task-resolution system based around Triumph and Misery. Dynamic Nobilis is designed for live-action play, but can be used to replace the usual Nobilis mechanics for tabletop games. * A complete Dynamic Nobilis adventure, 'Heaven's Gate', concerning the fate of a painting that is part-angel and part-demon. It is suitable for any number of players, though thirty is a sensible upper limit, and less than one may prove impractical.